When talking “technology” among you colleagues and friends, who comes to mind as the man that started it all? Would it be Bill Gates? Steve Jobs? Or maybe in your circle of friends it’s all about Linus Torvalds? Well, in honor of Father’s Day, let’s think back even farther. Back to the real “Father of Computers” and the man that in many ways really is the one that is truly responsible for kicking off this progression that has led to where we are today. I’m talking (of course) about Charles Babbage. He was given the title “Father of Computers” in 1970 by Daniel Halacy. Charles’ life’s work was to create a machine (Difference Engine) that would replace the need for a person to perform the painstakingly tedious task of manual calculations. At the time, it was a low-level mindless job function performed by a team of people referred to as “computers” because their sole job duty was to add and subtract (to compute) data. It was terribly inefficient and there were many errors in the calculation. Charles believed that a machine could be built to accomplish this task and replace the need for a large staff of unskilled workers performing basic addition and subtraction, and that the machine could be relied on to perform these computations more accurately at a much faster rate. This (for all practical purposes) was the first time a machine would be referred to as a “computer”. This was the mechanical offspring that earned Babbage the title “The Father of Computers”. Charles Babbage gave birth to this idea. He spent his life designing and redesigning this “Difference Engine” (mechanical computer) and it has gone on to develop quite a life of its own. Did he know the impact this would have on the world? Did he know that his mechanical offspring would go on to create the ideas and new offspring and one day there would be computers carried around in people’s pockets more powerful than anything ever imagined at the time? As a father, I can’t imagine all the ways my babies will grow up and impact the lives around them. I try to instill my values and ensure they are happy and healthy in childhood with (of course) the hopes that one day they grow up and realize all their dreams in life. Every parent wants their child to succeed. We want them to grow and develop a great life in adulthood; but can we really imagine the impact our children will have on the world 20 or 30 years from now? We would like to imagine we will still be around to see our babies grow to their full potential in adulthood and see the wonderful life we created making a positive impact on our world. This unfortunately wasn’t the case for Mr. Babbage. His Difference Engine would not be completed until 1991 (120 years after his death) and its first computation successfully returned a result with 31 digits, far more than the modern calculator. He is quoted (referring to this Difference Engine) as saying, “Another age must be the judge” because he did not have the parts, nor the technology, to see his designs to completion. The designs he created went on to form a life of their own and have, in turn, flourished and thrived to spawn advancements in technology far beyond his wildest dreams. The basic architecture of Babbage’s machines is not much different than a modern computer. The data and program memory are separated, operation was instruction based, the control unit could make conditional jumps and the machines had a separate I/O unit. So in many ways, that he himself probably didn’t completely realize, he designed a machine that would become the basis for the modern computer and change the world forever. Next time you’re talking “technology” with your friends and coworkers, see how many of them can actually recall who holds the title “The Father of Computers”. Remind them that it was the designs and ideas of Charles Babbage that really started it all. 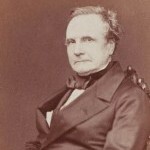 Happy Father’s Day to you, Charles Babbage, and to all of you great dads out there!